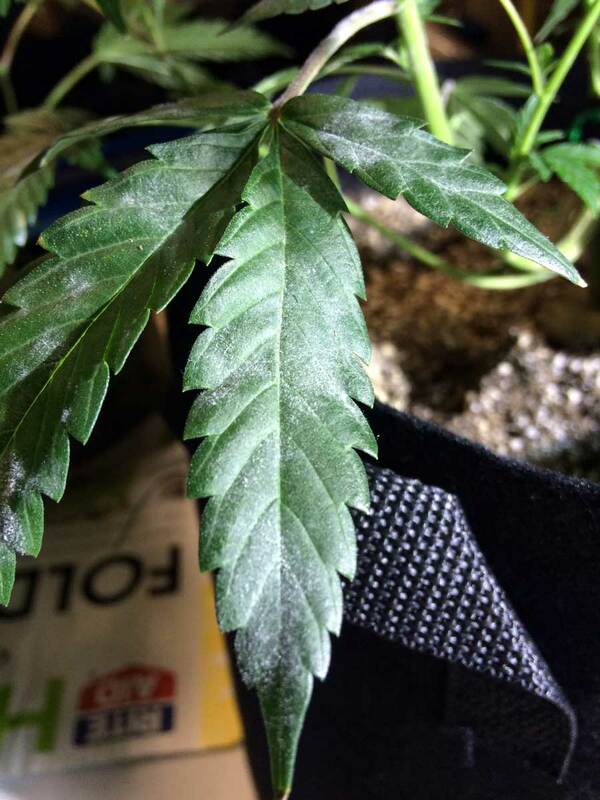 White spots on your leaves? Leaves dusted with round patches of powder that looks like flour? 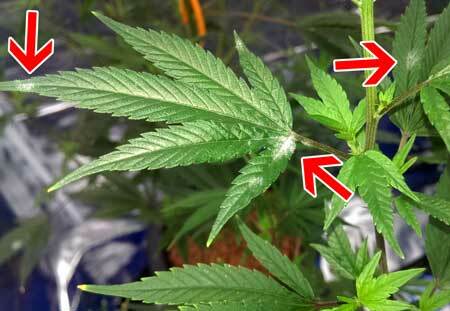 It could be White Powdery Mildew, also known as White Powdery Mold or just “WPM” to cannabis growers. 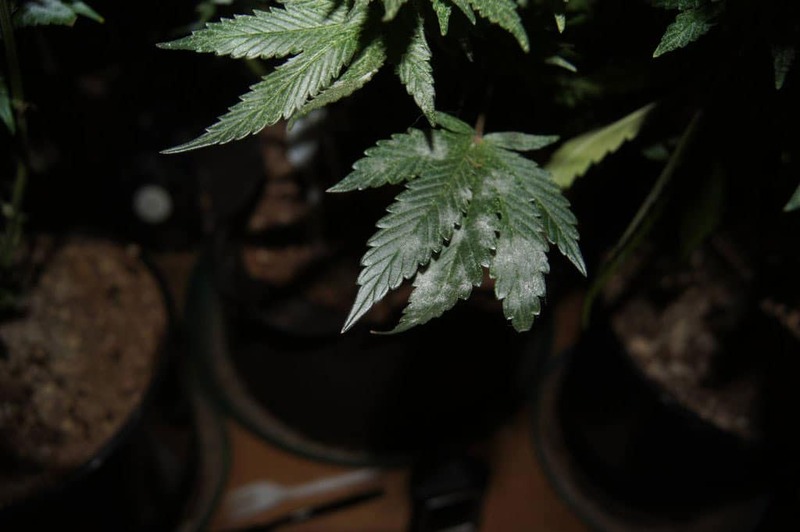 WPM is usually a minor annoyance that’s easily fixed, but if you don’t catch it early, white powdery mold can turn into a relative catastrophe that ruins an entire marijuana harvest! Imagine circular patches of a living, breathing, fuzzy, flour-looking substance showing up on your plant’s leaves without any warning. 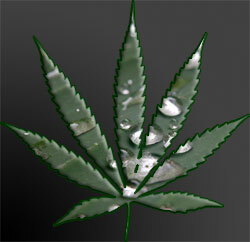 From there, the mildew can easily spread to other leaves and buds, rendering the buds unusable. 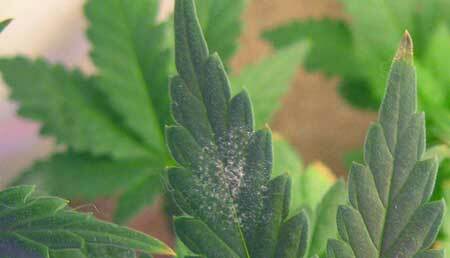 White Powdery Mildew has such an easy time spreading that even careful growers who take proper precautions can still experience it. Luckily, the issue was easily resolved because it was caught early and because White Powdery Mildew is completely reversible up to a point. This article will arm you with the information to stop this fungus’ proliferation before it even has a chance to take hold! 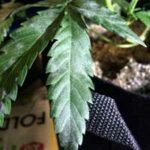 Fortunately, White Powdery Mildew is easy to spot since the white patches of fungal growth it creates stand out against cannabis’ green leaves. 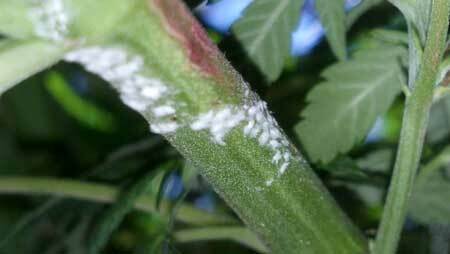 It can be removed from plants with proper treatment if spotted early on, but any buds with WPM should be discarded as they most likely contain many more spores than your eye can see. WPM needs moisture to thrive, but that doesn’t necessarily mean it needs water. Having a grow area with high humidity is all WPM needs to grow. This seems to be a bit problematic since young cannabis plants grow best in relatively humid environments (40% -60% RH). Luckily, high humidity usually only becomes an issue when it’s combined with the next cause (low/no airflow). People who live in environments with extremely high humidity (such as Florida and the UK) can purchase a dehumidifier to control humidity in the grow area. This is especially important during the flowering phase when humidity needs to be much lower (45% rh) to prevent rampant growth of WPM and bud mold. 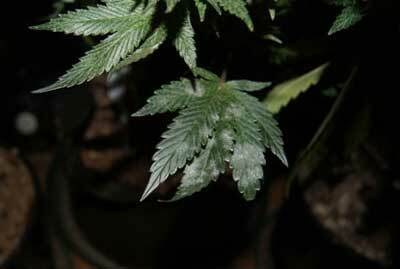 White Powdery Mildew has a hard time settling in a grow room where the air is being moved. High humidity will give WPM the conditions it needs to survive, but poor airflow is what gives it the ability to settle down in the first place. In fact, a small (preferably oscillating) fan moving air in a grow area will prevent the vast majority of White Powdery Mildew woes. If you have WPM spores in your grow area and the air in grow area is never exchanged for fresh air, the spores get multiple chances to land on your plants and reproduce. 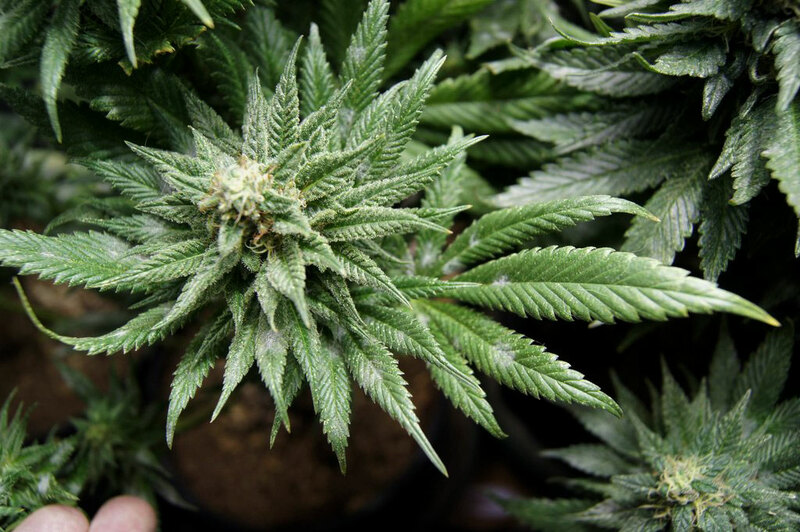 This happens most often in conditions where cannabis is being grown in a closed, unventilated space – such as a closet – and precautions aren’t taken to exchange old stale air for new fresh air. Leaves that are touching each other will form moisture between them, and thus they become more likely to contract WPM. 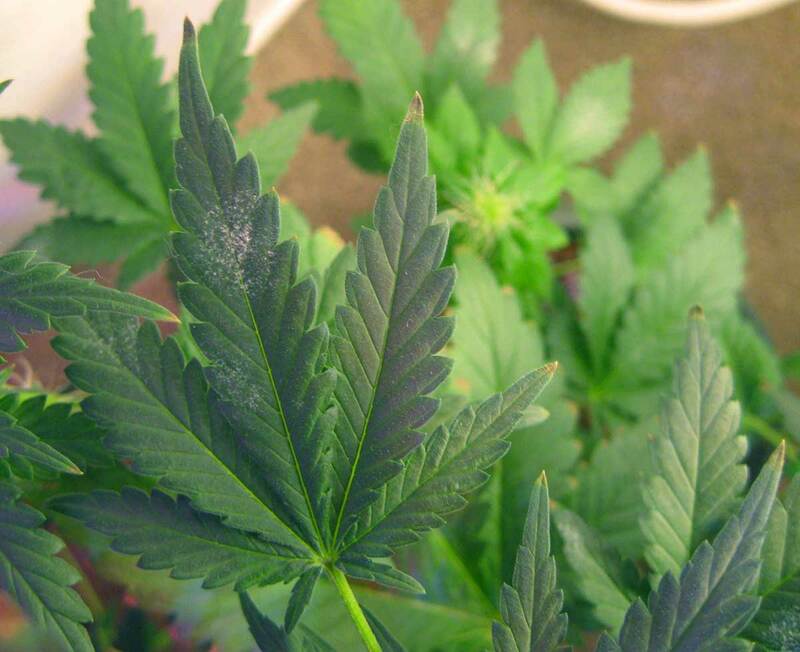 Untrained bushy/leafy plants with lots of new vegetative growth are especially prone since plants will often have leaves mashed up against each other as they try to reach the light. Advanced growers can defoliate some of the fan leaves that are completely shaded from the grow light to make fewer choice landing spots for White Powdery Mildew. Also, defoliation frees up energy for the plant to use when done correctly and increases yields! 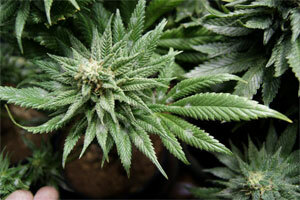 See our article on defoliation for more info. As I mentioned earlier, I recently had a battle with White Powdery Mildew. Rather, it might have been a battle if I noticed it later or waited to fix the problem. That’s the one good thing about WPM: in most cases when WPM is caught early, you can remove all traces of the mildew without harming your plants. Remove White Powdery Mildew from leaves – Get some water (tap water works fine) and some paper towels. Wet the paper towels and use them to gently wipe the mildew off the affected leaves whilst being careful not to jostle any leaves with spores on them. Using a wet cloth will ensure that more spores stick to the cloth instead of becoming airborne. Note: While it isn’t necessary to use paper towels, their disposability helps to curb the spread of spores from one leaf to another. Ensure plants have proper airflow and ventilation – Even if you have absolutely no airflow or ventilation in your grow room, having even two fans will drastically reduce your chances of encountering WPM while also benefitting your plants overall health. One fan should be oscillating if possible and should gently blow air over your plants. All the plants need is enough air to gently rustle their leaves. The second fan should be in your grow room pointing outward, pulling heat away from your plants (only needed if you have no ventilation). Having a fan pointing out of your grow room will force old air out of the room, and in turn, pull new air into the room. At this point, you’ll have new air coming in, being used and circulated, then kicked out. Keep in mind that two fans is a minimum. 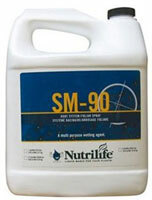 Treat plant with SM90 to kill spores prevent future growth – Mix 1 part SM90 to 5 parts water(I’ve found 7 parts water to be equally effective) in a clean sprayer/mister. Wait until just before your lights for off for the day and mist your (newly cleaned) plants. Get all the leaves! This diluted SM90 mixed will kill any spores it touches, and anywhere it lands becomes uninhabitable for future spores. Plus, it’s safe to use – even during flowering – and it smells awesome. There you have it. If you end up running into White Powdery Mildew, give this advice a shot and you won’t have to deal with it past that first day. If you do end up using these steps, feel free to let us know if it helped you or not, or how you did it differently. When growers know just a little bit about this disease, it doesn’t have a chance! What’s the easiest way to fight against White Powdery Mildew? 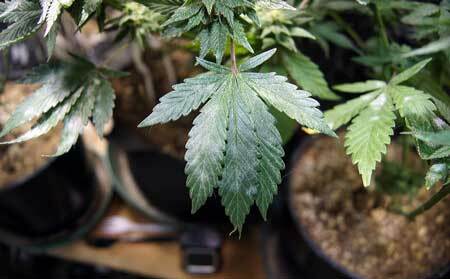 Get the right stuff to let White Powdery Mildew know that your grow room is off limits! 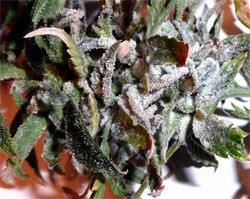 SM-90 – kills WPM, is safe for buds, AND it smells GREAT! Handheld Mister/Sprayer – A Mister is awesome for applying SM-90. Also, it’s the best way to foliar feed your plants! Bonus! Papaya cannabis strain – The strain Papaya is potent, flowers early, and – most importantly – is disease resistant! What Causes Dry or Crispy Leaves?